Our Recycled Denim Challenge has given way to some beautiful designs. 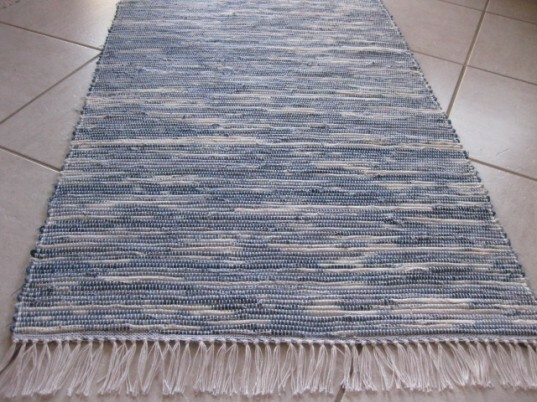 Handmade by Terry Dewal, this incredible woven rug gives new meaning to the term “from rags to riches.” Taking his old, beat-up blue jeans and cutting them into narrow strips, Terry managed to craft an attractive and versatile rug on his floor loom. Long wearing and machine-washable, even when subjected to all the wear and tear of daily foot traffic, his design – like your favorite pair of jeans – will just get better with age! Our Recycled Denim Challenge has given way to some beautiful designs. Handmade by Terry Dewal, this incredible woven rug gives new meaning to the term "from rags to riches." Taking his old, beat-up blue jeans and cutting them into narrow strips, Terry managed to craft an attractive and versatile rug on his floor loom. Long wearing and machine-washable, even when subjected to all the wear and tear of daily foot traffic, his design - like your favorite pair of jeans - will just get better with age!